New Zealand yard Circa Marine has announced that it has launched the 26.27 metre Cochise, the first hull in its FPB 78 superyacht series. 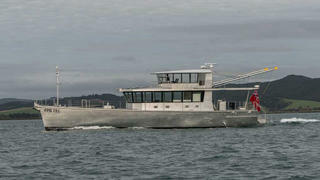 This all-aluminium yacht was splashed last month and is currently undergoing sea trials off Whangarei, where she hit a top speed of 13.25 knots. Styled inside and out by Dashew Offshore, Cochise features accommodation for six guests split across three cabins, with crew quarters in the stern for a staff of two. The full-beam master suite is spread across the full 6.35 metre beam. Her raised pilothouse and extensive glazing ensure great views out in all directions, while an enclosed air conditioned wheelhouse provides the primary entertaining space on board, complete with a pop-up television. Designed with blue-water cruising in mind, Cochise was fitted with a pair of 470hp John Deere engines that draw on an 18,350-litre fuel tank. When trimmed back to her cruising speed of ten knots, this yacht’s slender semi-displacement hull should deliver a globetrotting cruising range of 7,100 nautical miles. Solar panelling on the roof of the wheelhouse helps to reduce the need to use the diesel-powered generator, further adding to this utilitarian yacht’s efficiency and eco credentials. Other key features on board Cochise include a 7,380-litre water tank, NAIAD stabilisers, and a pair of aft deck cranes that allow her to carry two tenders. Cochise is the first FPB 78 to hit the water and Circa Marine is already working on three further hulls, two of which have been sold to former FPB 64 owners.